India is densely populated and has high solar isolation, an ideal combination for using solar power in India. In July 2009, India unveiled a US$19 billion plan to produce 20GW of solar power by 2020. 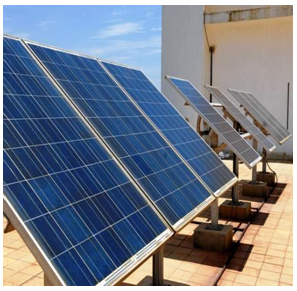 In January 2015, the Indian government significantly expanded its solar plans, targeting US$100 billion of investment and 100GW of solar capacity by 2022. Rajasthan and Madhya Pradesh is one of the states of India in the field of solar energy. In this context, Oswal Woollen Mills also setup 5MW Solar Plant at Village Jatisara, Tehsil Phalodi, Distt Jodhpur (Rajasthan) -342301. The plant is spread over an area of 39 Beegha from Rajasthan Govt. for 25years on Lease. The total cost of this project is Rs.73.00 crores. All the power generated by this plant supplied to NTPC. Further, the Company has set up another 5MW Solar Plant at Village Dhe, Tehsil Kolayat, Distt Bikaner (Rajasthan) -334302. The plant is spread over an area of 25.95 acres. The total cost of this project is Rs.47.00 crores. All the power generated by this plant supplied to Rajasthan Govt. Accelerated deployment of clean energy offers the single biggest solution to the three vexing problems facing the world today: fossil fuel depletion, environmental unsustainability, and climate change. In the last two decades, wind power has emerged as the leading green energy technology, growing at a record. Oswal Woollen Mills also setup (Four) No of Wind Energy Generators (WEG) cost Rs.30 Crores in following States and all are fully operational.